From the few occassions when I was able to spot the Banded Bay Cuckoo, I consider myself to be real lucky this time to be able to get a photo of this bird. As in previous sightings, the bird was calling from the edge of (disturbed) forest. If you are not familiar with the call, look for dark eye stripe and pale supercilium with dark eye ring. The Greater Coucal Centropus sinensis is a common bird of secondary and degraded forest. It is not uncommon to have it fly across the road you are driving on and then disappearing into the foilage. Its loud calls, a continuous series of booh can be heard in most places outside of the city areas. 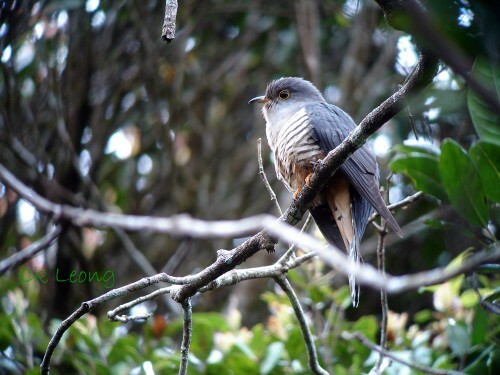 Even though it is a cuckoo, it is not a brood parasite. 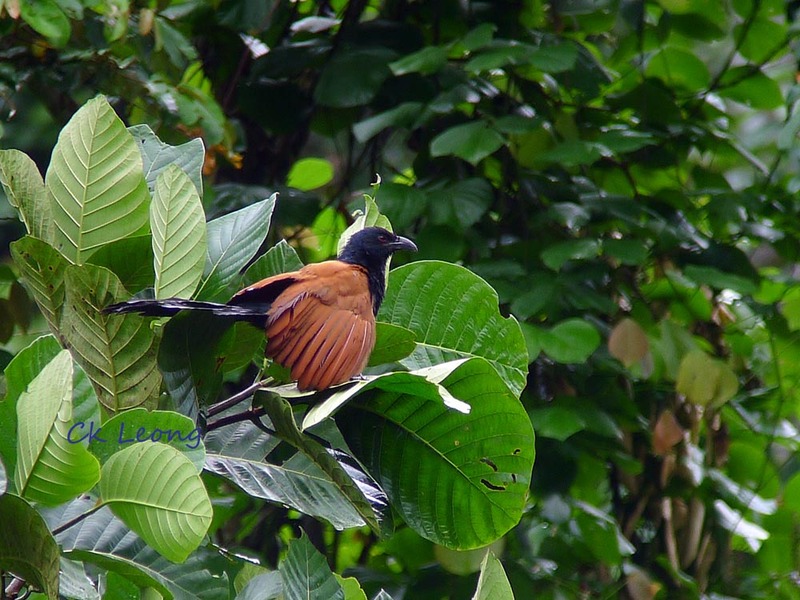 There are locals who believe that injured young birds are fed a variety of medicinal plants by their parents. The well-again birds when preserved in brandy and other medicinal plants produce a concoction said to be helpful with damaged bones and joints. 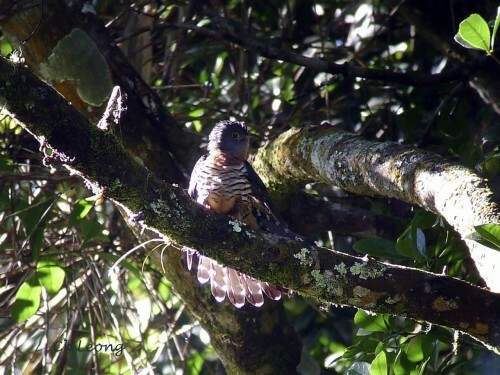 The Dark Hawk-cuckoo Hierococcyx bocki was previously considered as a race of the Large Hawk-cuckoo. Locally common in hill and montane habitat (Mt. Kinabalu, Rafflesia F.R. ), it will be easier to find the bird if you could familiarised yourself with the call, a repeated two note whistle with a longer second note. Enjoy. 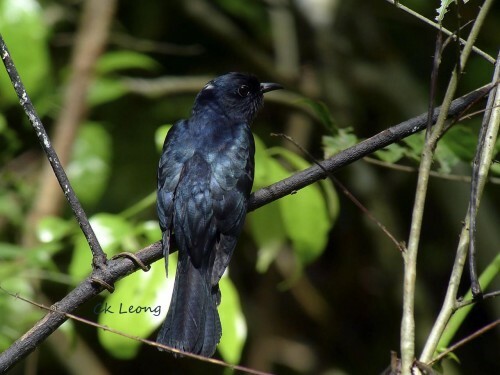 The Square-tailed Drongo-cuckoo Surniculus lugubris has got to have one of the most recognizable calls in the lowland forest of Borneo. The first loud pi is followed, evenly timed, by a series of ascending pi. As is the case with other cuckoos, such calls can be heard throughout the day and sometimes at night. Spotting it may be a bit more difficult. 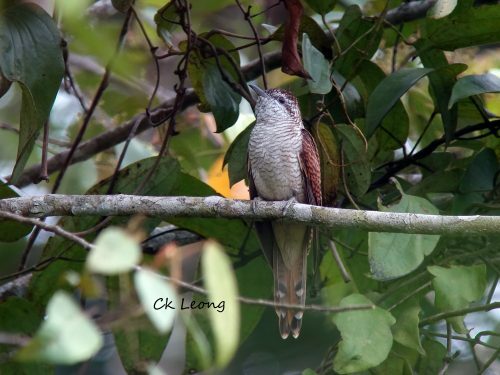 If you are visiting Mt Kinabalu between February and April, you would most likely hear the 3 note call of the Sunda Cuckoo Cuculus lepidus. Reduced vocalisation during the other months of the year makes it more challenging to look for then, even though it is a common resident here. It used to be lumped together with Oriental Cuckoo but is now a species on its own, based on differences in size, call and plumage.